Do you ever drive blindfolded? Probably not. Do you ever drive and use your cell phone? Probably yes. Guess what? There’s little difference between the two. April is Distracted Driving Awareness Month, and with good reason. Distracted driving is a national epidemic. And sadly, a large majority of drivers – from teens to older adults – drive distracted every day, every time they drive. You look at your front seat passenger while talking. You give a scolding to the kids in the back seat via the rearview mirror. You hunt for a napkin in the fast-food bag to wipe up the soda spill. You’re in a bad mood and thinking about what got you there. You just need to send one quick text. Really, it will only take a second. An average of 9 people are killed and 1,153 injured every day in vehicle accidents involving distracted drivers. In 2014, 3,179 people were killed and 431,000 were injured in vehicle accidents involving distracted drivers. Each day, approximately 660,000 drivers are using cell phones or electronic devices while driving. Among drivers ages 18-64, 33% report reading or writing text messages while driving in the past 30 days. An average of 1 in 4 motor vehicle accidents involve cell phone use. Texting while driving is the equivalent of having four beers and makes you six times more likely to have an accident than driving while intoxicated. 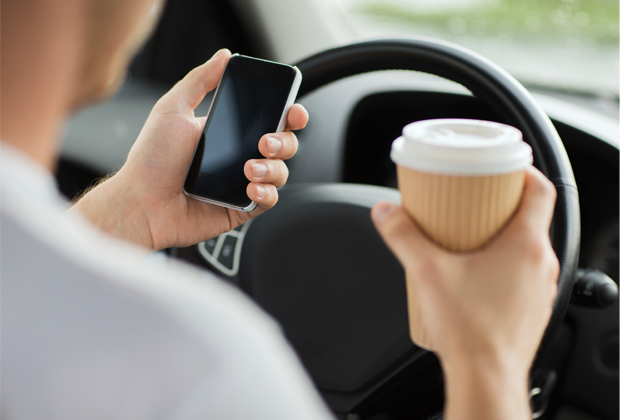 Adults admit to sending or receiving text messages 27% of the time they’re behind the wheel. About 55% of teens say it’s easy for them to text while driving. A distracted driver spends about 10% out of the lane of travel. Despite laws in 14 states that ban hand-held cell phone use, and in 46 states that ban texting while driving, drivers continue to put themselves, their passengers, and other motorists and pedestrians in danger by driving distracted. There’s only one way to stop distracted driving: pay attention. Keep your cell phone out of reach while driving, and make the promise to not use it until you’re off the road. Don’t eat or drink while driving. If you do, be sure to pull off the road to clean up any food or beverage spills. Don’t let front seat passengers, rowdy kids, or pets distract you. Keep your eyes on the road while you talk. Save the grooming routine for the bathroom mirror. Don’t comb your hair, put on makeup, shave, or brush your teeth while driving. Pull over to adjust the GPS, rather than fiddle with it in the fast lane. If your mind is elsewhere, bring it back to the front seat by focusing on something unique about the vehicle in front of you. Make a promise to yourself and those you love that you won’t drive distracted. Download the safe driving pledge-form and have your friends and family sign it. Share with us how you keep focused on the road with so many distractions while driving!